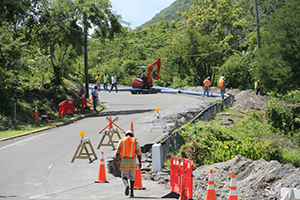 NIA CHARLESTOWN NEVIS (September 30, 2014) — Work on the Nevis Water Supply Enhancement Project continues in the Maddens area. 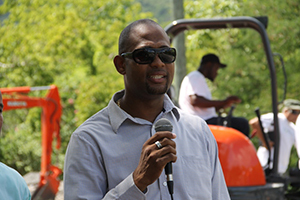 Officials of the Nevis Water Department (NWD) and the Public Works Department (PWD) have urged the public to exercise caution when in the vicinity of the project and be prepared for unplanned water supply disruptions. Roger Hanley Manager of the NWD and Deora Pemberton Director of the PWD spoke to the Department of Information at Maddens at the scene of the Project’s pipe installation on September 24, 2014. 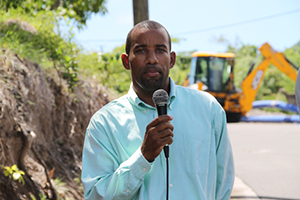 “We are here to make the general public aware of the risks that would be involved as we install our pipes along the Island Main Road. We also want to make the general public aware that during the installation process of this new 10 inch pipeline, there is a possibility that we would experience interruption of the water service. “So we want to ask the general public to bear with us as we engage in this installation process and we would endeavour to make sure that the supply is restored within a reasonable time,” Hanley said. The NWD Manager noted, the ongoing work consisted of pipe installation from Maddens to Camps. “This 10 inch main would be the major conduit to facilitate a larger transfer of water from the new Maddens Reservoir to the new Camps reservoir,” he said. According to Hanley, work on the Maddens/Camps section of the project was projected to be completed between December 2014 and January 2015 because the pipe installation was a slow process in which the pipes were pressure tested before they were completely buried. The NWD Manager also spoke to the other areas in which waterlines would be installed for the Project. “The other areas that we have to install or upgrade our services is a new pumping line from the new Camps tank up to the new Spring Hill tank. 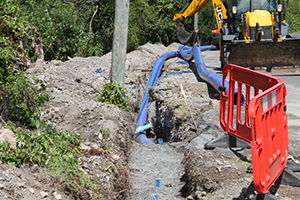 We also have a new distribution pipeline from Spring Hill down to Westbury and we will also be working in Fothergills Estate to Stoney Hill, where we will be installing approximately 2,000 feet of 10 inch pump mains. Also we have some distribution upgrades in the Stoney Hill/Rawlins area and distribution upgrades in the Morning Star area. “So it’s quite a bit of activity over the next year onwards,” he said. Meantime, Pemberton spoke to the disruption work could cause to traffic as the NWD assisted with civil works. “Our role in this project is to be basically facilitate the Water Department with civil works, ensuring that the work is done with minimal disruption to the road. “As you might have seen travelling this area, we have had to cut some of the asphalt to facilitate the installation of this new pipe that’s being done. This was something that we felt was absolutely necessary because there are existing six inch and four inch mains in this area that we are working right now,” he said. Pemberton called for the public’s support and urged them to take note of the traffic signs. “You would also notice on the road that we have quite a few safety gears: cones, barriers, lights. We are asking the general public to observe these safety signs and gears and be very cautious when you are travelling through this area. It is an interruption. It is an inconvenience to the travelling public but we are asking your indulgence and your support, as we go through this upgrade phase of the water project. “You would also see during the daytime while the guys are working some traffic guides with ‘slow’ and ‘stop’ signs. These personnel are equipped with hand radios signalling from one end to the other when traffic could flow. So you probably might be asked to just wait a few minutes while the traffic or the area that is being worked on is cleared. I want to appeal to the general public to just give us your support while we engage in this project for the minor inconvenience that you will encounter, just bear with us,” he said.